The Noble Hill wine estate is a beautiful, small estate that takes pride in crafting authentic, elegant wines found in South Africa. 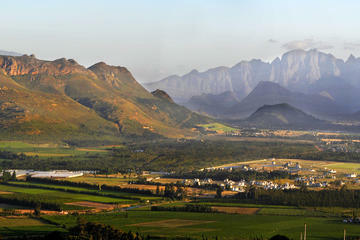 It is located in the Simonsberg-Paarl mountains, which has given birth to some of the greatest wines since the 1600’s. Babylonstoren is one of the oldest, state-of-the-art wineries in the Cape, dating back to 1692. It is host to 13 varieties of grapes and makes use of multiple fermentation processes that create their award-winning wines. The farm is designed according to 17th century Cape Dutch architecture and has a gorgeous greenhouse that is used to grow fruits, vegetables and berries. 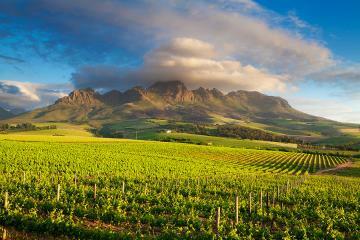 Backsberg is an ever-popular wine farm that has today, grown into a household brand. Since its launch in 1970, it has become home to vintage, classic and premium wines. Their aim is to cater to a broad range of wine lovers. Backsberg selects grapes from top performing farms to develop exceptional creations with character and, in their words, ‘finesse’. Their white wines are cellared for 2-3 years, while their reds are left to mature for 8-10 years. Only having launched in 1895, Glen Carlou is a relatively young vineyard that has quickly developed a reputation as a leader in wine production in South Africa. Due to its location, Glen Carlou enjoys unique growing conditions with warm, dry summers and cold, wet winters; the vineyard benefits from rich soil that allows the highest quality grapes to be grown and produced. Solms Delta is a recently transformed vineyard, known for working alongside the disadvantaged in order to increase community upliftment in the area. Lifestyle – comprised of five, everyday wines. Included in this collection is their best-selling, Rose. Heritage – includes wines that are distinctive to the vineyard. They are symbolic of the heritage behind Solms Delta. Terroir – the more expensive collections. Unique wines produced from premium grapes meant for special occasions. Vrede en Lust wines are produced to the highest of standards. Due to the farm’s location, the grapes are grown in rich soil and perfect weather conditions. Vrede en Lust has been producing quality wines for the past 300 years and is now home to 8 white wines, 11 red, rose and prosecco. Plaisir de Merle has been curating quality wines for over 400 years. 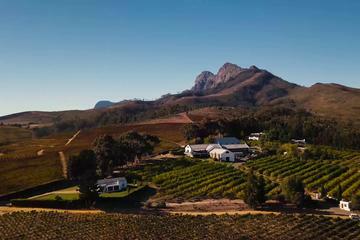 The legacy continues at this beautiful wine farm, comprised of an incredible view of the Simonsberg mountains and tasting opportunities with their award-winning wines. Established in 1690, Allee Bleue is a quaint vineyard that aims to offer guests a unique wine tasting experience. The Dauphin family, having taken over in 1999, has set high standards for the quality produce you see today. With a beautiful location and world-class wine, what could be better? One of the more popular wine farms in the Franschhoek wine valley, also owned by Sir Richard Branson himself, this gorgeous wine farm is home to some of the most elegant, top-quality, award-winning wines. Book yourself a table at the vineyard restaurant as they serve some of the most incredible, gourmet dishes. Another one of the most popular spots along this Franschhoek tour is Le Lude. Today, this vineyard has paved the way for new creations in the South African wine industry; being the first cellar to produce the Agrafe Cap Classique. Le Lude was one of the first to produce sparkling wines in South Africa and their mission is to continue to produce premium wines of pure excellence. La Bri is a family owned vineyard, which came back to life in 2008, harvesting their first produce in their brand new cellar that is able to hold 120-tonnes of wine. Their new processes work to produce limited wines paired with unlimited elegance and quality. A small, yet beautiful wine farm that not only produces classic wines, but also grows pears, plums and olives. Enjoy their lovely range of wines and pair them with their house chocolate, produced specifically for the ‘La Bourgogne’ range. Found in a prime location in Franschhoek, enjoy the Holden Manz range of speciality red wines. Revel in the finer things in life with this state-of-the-art winery and restaurant. With breathtaking views of this all popular wine valley, La Couronne celebrates 300 years of wine culture. With an award-winning Merlot Rose, you cannot go wrong when deciding to visit this estate. La Couronne has also opened their brand new wine tasting centre to showcase the vineyards range of top-class wines; we also suggest their chocolate and wine pairing. Hidden amongst the Dassenberg mountains, Rickety Bridge has today developed a range of incredible wines that are highly distinctive to South African tastes. This vineyard is by far one of the most exemplary estates, having earned a multitude of awards at award shows around South Africa and the rest of the world. Grande Provence was purchased in 2004 by Dutch and Belgian business people with an undeniable passion for food, wine and luxury. Enjoy perfectly cultivated wines in this European inspired estate. 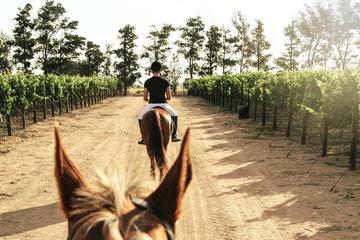 Learn about the farm’s history and what it takes to make top-quality wines. Maison recently joined forces with the ever-popular Chefs warehouse; a world-renowned restaurant, known for its progressive food culture that is sought after all over the world. With that being said, one can imagine the standards Maison lives up to. Maison wine estate has a transparent work ethic when it comes to the cultivation of their wine. It is evident in the careful hand-selection of their grapes and the nurturing of their growth to full potential without cutting corners. Eikehof is the proud home to 6 varieties of wine as well as a peach orchard. This farm is well-known for having the oldest growth of Semillon vines from South Africa, dating back to the 1900’s. Eikehof wines are made from the finest grapes, produced to their full potential. Leopards Leap vineyards produce top-quality wines at affordable prices. They pride themselves upon cultivating easy-drinking wines that are suitable for any occasion. Leopards Leap has a popular tasting room and views of the picturesque landscape. Chamonix is one of the largest vineyards, also hosting farmland and a game reserve comprised of zebra, springbok and wildebeest. The most popular wines, which are a ‘must-try’, are the Chenin Blanc, Sauvignon, Pinotage and Pinot Noir. An interesting fact about the Chenin is that seeds were planted about 60 years ago with the purpose of producing brandy. However, due to South African climate, the vines evolved into what they are today. Dieu Donné Vineyards was bought by the French-Mauritian in search of his French roots right here in South Africa. 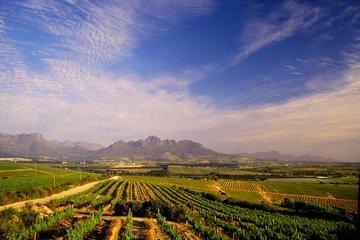 The farm produces quality wines due to its location amongst the Franschhoek mountains. Being hidden from the hottest part of the day, grapes are able to ripen slowly. Dieu Donne soils are also never irrigated to ensure concentrated flavours. Dieu Donne vineyards produce, Merlot, Cab Sauvignon, Shiraz, Chardonnay and Sauvignon Blanc and have recently added a Méthode Cap Classique and Viognier to its collection. Merlot is the award winner of the cellar and should definitely be tried whilst visiting. Pair country leisure with the elegance of a world-class wine estate, and you will have the Franschhoek wine cellar. Saving the best for last, this wine estate is a staple to the Franschhoek wine valley. Enjoy chocolate and cheese tastings, or a quick meal in their gorgeous gardens. Should you wish to take a break from wine tasting, you can also enjoy a pint in their very own beer garden. The Franschhoek Cellar has produced award-winning reds, whites and Methode Cap Classique. What a great way to explore the areas outside of Capetown. I highly recommend this tour. The countryside is beautiful and the wineries were really good. Nice day! Emmanuel is the best! Stellenbosch and Franschhoek is so beautiful! Definitely worth the trip! This tour is very good! I had a wonderful day exploring the vineyards of South Africa with a great group led by our tour guide, Phillip. I particularly enjoyed exploring the lovely town of Stellenbosch. Tasting the wines of Remhoogte, looking over a panoramic view of the mountains and looking at the zebras and wildebeest in the valley, was a truly magical experience. Phillip was a wonderful guide, informative and interesting. I thoroughly enjoyed the day and look forward to someday returning to a lovely part of the world. 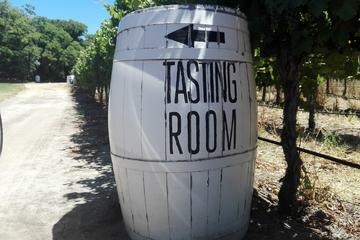 This tour gave you a good sense of the Winelands region . I think it would be better to only visit two wineries. leaving time to drive through Paarl and more time in Stellenbosch or Paarl.Also, starting a half to three quarters of an hour earlier would make things less rushed. It was a good tour with the three wine tastings as mentioned, but our tour did not include the visit to the farming village as mentioned in the description. We should have realized when booking the tour that early morning wine drinking was not for us other than that the tour was great. Leizel made our experience one to remember. She was more than accommodating to us and our kids on the tour and her knowledge of the area made for a relaxing, but once-in-a-lifetime memory for our entire family. Thank you! We had an excellent guide who was able to let us personalize out trip and spend the time doing what we enjoyed rather than rushing from place to place just to check them off. 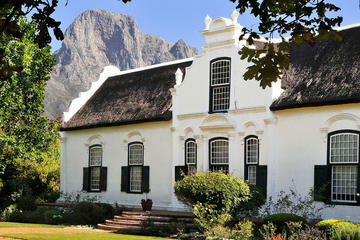 Consequently we awere able to tour the Stellenbosch Museum and really spend some quality time there – it is fascinating. We also enjoyed an excellent lunch at the Coopmanhuijs Hotel which has excellent food and service. Our guide was fantastic she was soo knowledgable and friendly. My friends had soo much fun and took lovely pictures at the vineyard and the wine tasting was very good. I would recommend people to try this tour because you get our of the city and see other areas! Private tour. Very knowledgeable and attentive driver/guide James who readily offered insights not only in the wine lands, but also in the culture and society of South Africa. We liked the choice of three quite different wine estates/degustations and the well-timed programme which allowed for individual stops and sufficient time to explore the wineries, as well as the picturesque towns of Stellenbosch and Franschhoek. I enjoyed going to the wine country and the wineries that were on the itinerary. The tour guide/driver was difficult to understand. We were collected from our hotel by our guide for our day tour of the wine vineyards named Basil. He started by giving us the background history as we drove out of Capetown. Our party of 7 people were surprised to learn in his 61 years, he had never left Capetown. We visited 3 vineyards and I sampled 15 wines. Very nice scenery in the wine growing areas. I would recommend this tour. Absolutely loved it, bound to feel a bit drunk though! Plenty of time to relax and wander around the old towns. This tour was by far my favorite during my visit to South Africa. The vineyards we visited were top notch and I really impressed by the wine/food samples. Our tour guide provided a lot of information about this region and I would not hesitate to recommend him to others. If you want to see a beautiful, historic area of the country, as well as looking for a tour which is value-for-money, this is it.